The Best Indonesian Food blogs from thousands of top Indonesian Food blogs in our index using search and social metrics. Data will be refreshed once a week. Indonesia About Blog Kokiku is an Indonesian production, hand-crafted with passion and bursting with great visuals. Not only do we share authentic & modern Indonesian food recipes, but also Asian and Western dishes with easy-to-follow recipes and guides. Kokiku TV features a mix of Indonesian celebrity-chefs and home-cooks who just love to make the world a better place, one food at a time. Let's get cooking! Facebook fans 131,921. Twitter followers 16,438. Facebook fans 2,935. Twitter followers 4,108. California, USA About Blog Easy Indonesian recipes by Anita, the cook, author, and photographer behind Daily Cooking Quest. Facebook fans 2,033. Twitter followers 77. Denpasar Selatan, Bali About Blog Indonesian Foodblogger based in Bali. Berbagi resep praktis, review kuliner dan travelling. Facebook fans 63. Twitter followers 779. Facebook fans 6,455. Twitter followers 706. Bandung, Indonesia About Blog As the name implies, Foodnotebdg is our collection of Culinary Notes in Bandung. In addition to culinary, there are also our travel records in some hotels, tourist attractions and other activities both in Bandung and outside Bandung. Facebook fans 838. Twitter followers 668. Kota Batam, Kepulauan Riau About Blog My name is Chandra. I currently live in Batam Island, Indonesia. I love to share my food adventure. Please do share these food on your page if you think they are delicious! Facebook fans 2,093. Twitter followers 135. Jakarta/Bogor-Indonesia About Blog Indonesian Food And Travel blogger based in Jakarta. Tere share easy recipes to cook, places to eat, destinations to go, and go local. Facebook fans 100. Twitter followers 435. Jakarta About Blog From Street Food to Michelin Star we tell stories of food & travel. We are also a Professional Food Photography studio based in Jakarta. Facebook fans 838. Twitter followers 3,831. Indonesia About Blog This channel was created to promote the Food for People, Food Indonesia and intends to help the food trade and to provide food to low-income households (less capable), employees etc. About Blog Hi, welcome to Luksunshine, a cooking and baking channel. On my channel, you will find recipes about Indonesian-Asian recipes, sweet and savory. Indonesia About Blog Indonesian Food is a Channel All About Food, Traditional Cooking. Welcome to Indonesia! Surabaya About Blog INIJIE - It's my food hunting journey, travelling notes and splash of photography saga. Facebook fans n/a. Twitter followers 191,167. About Blog UrbanOuteaters, a food and travel blog based in Jakarta and Bandung, Indonesia, was born and created through our obsessive passion for good food and exciting travel experiences. Jakarta, Indonesia About Blog Food Escape is Indonesian food, travel, leisure, and lifestyle blog created for people around the world. Facebook fans 726. Twitter followers 2,016. Facebook fans n/a. Twitter followers 4,616. Facebook fans n/a. Twitter followers 1,609. Sydney to Jakarta About Blog We’re Liz and Jo. Together we share a journey bespoke; a blog about our journeys and adventures in Jakarta, Indonesia. It is here that we will share our Jakarta Lifestyle and our passion for Food; to make, grow and to find..
Jakarta Capital Region About Blog Indonesian Food blogger based in Jakarta. We are Diarymakan, Blogger who loves food and mainly adventuring in Jakarta, Indonesia. We explore the Jakarta and Indonesian culinary, and also culinary around the world. We deliver all our fans in Indonesia and especially Jakarta the adventure of culinary by seeing things in our perspective, about the culinary in Indonesia. Hannover, Germany About Blog A food blog with daily delicious Indonesian recipes. Facebook fans 2,169. Twitter followers 1,076. About Blog Australian-Indonesian foodblog, full of restaurants and street food reviews, recipes, interesting product reviews, and travel experiences around Indonesia and Sydney as well. Facebook fans 462. Twitter followers 476. Jakarta About Blog Indonesian Food and Travel Blogger based in Jakarta. Facebook fans n/a. Twitter followers 739. Facebook fans 164. Twitter followers 671. Indonesia About Blog Natasha. V. L , a Jakarta based Food and Travel Blog since 2010. Sharing all the information about culinary, recipes and travel tips. Facebook fans 21. Twitter followers 1,440. Indonesia About Blog A Jakarta Food Blogger Shelmi Setiawan, blogging about Food and restaurant reviews in Indonesia. Everything here is about food and culinary journal. Facebook fans 3,604. Twitter followers 72. Indonesia About Blog Yovent a Indonesia Food Blogger and Social Media Influencer. Facebook fans n/a. Twitter followers 374. Indonesia About Blog Easy and delicious indonesian dish and recipes for family. Jakarta About Blog Vania Samperuru a Food Photographer and Food Stylist at Adventurelicious. About Blog This Vegetarian Recipe Various Blog contains vegetarian recipes that are partly the creations of Indonesian cuisine and snacks that are commonly known in the wider community. Some of the vegetarian recipes presented on this blog use ingredients from onion type vegetables such as onion, garlic, spring onion, chives, which are not consumed by some vegetarian circles. Facebook fans 9,118. Twitter followers n/a. About Blog There's More Than One Way To Eat A Durian. Blog about snack foods and snacks. Facebook fans 5,773. Twitter followers n/a. North Jakarta About Blog In this food blog you will find restaurant and hawker stalls review around Indonesia mostly Jakarta. Facebook fans n/a. Twitter followers 1,043. Jakarta, Indonesia About Blog A blog by Indonesian Food, Travel and Lifestyle blogger Santo Unsri, an enthusiast graphic designer. With his big passion not just in design but also in cullinary and travelling, he hopes to give some reviews and informations that might be helpful for any reader. Facebook fans n/a. Twitter followers 235. Indonesia About Blog Indonesian food blogger based in Jakarta. Share information about travel and lifestyle too. Food photograph by Windy Iwandi, Article by Andrey Raharja. Facebook fans 91. Twitter followers 36. About Blog Indonesia food blogger discuss Indonesian food, steak, restaurant, hotel review cafe good in Jakarta, Bogor, Bali and other cities. Jakarta About Blog The Hooman Being is an Indonesian food, travel and lifestyle blogger based in Jakarta who love to share more about what goes around in their life. Jakarta About Blog An Indonesian food blog by Jakarta based food blogger Aline Chandra who put some of her daily food adventure on Foolosophy. Facebook fans n/a. Twitter followers 1,224. About Blog An Indonesian food recipe blog by HarrySoepandi Skom. About Blog This blog is about Indonesian homey cooking, featuring simple and easy Indonesian recipe and also some authentic more complicated dish. Indonesia About Blog Yulyan Parwati, an Indonesian based food blogger who is looking forward to share her recipes and her experience in cooking, baking, food photography or making bento. Facebook fans 595. Twitter followers 197. About Blog A Indonesian Cooking site with modern and traditional easy to cook Indonesian recipes. Jakarta About Blog A Jakarta Based Food & Travel Blog by Jeffri & Lucy. Jakarta, Indonesia About Blog Tika, the owner and author of Cooking Chapter, is the food stylist and food photographer of all photos in this blog. Facebook fans n/a. Twitter followers 223. Facebook fans 181. Twitter followers n/a. 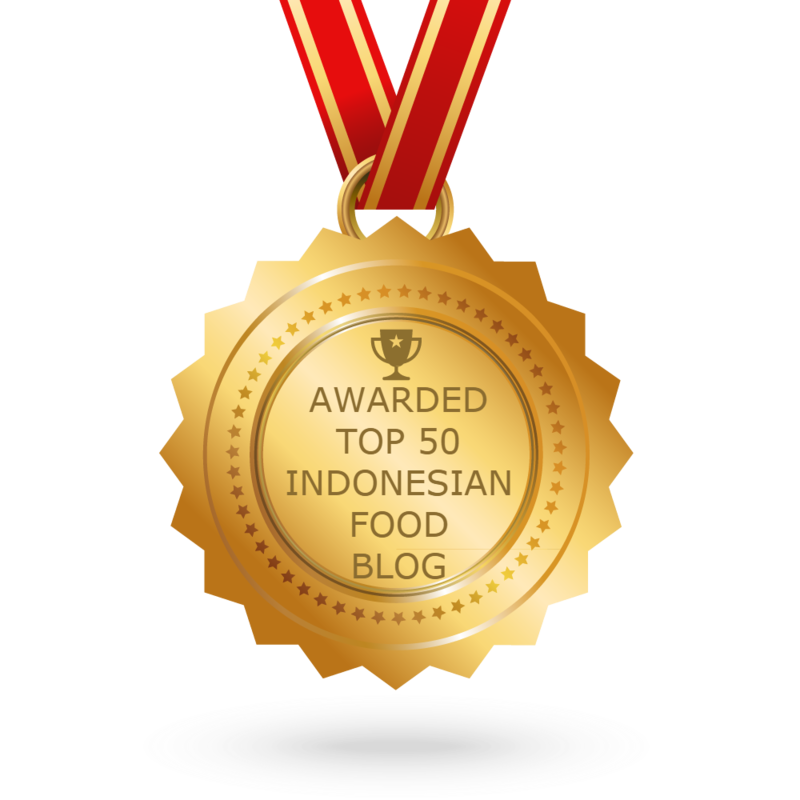 CONGRATULATIONS to every blogger that has made this Top Indonesian Food Blogs list! This is the most comprehensive list of best Indonesian Food blogs on the internet and I’m honoured to have you as part of this! I personally give you a high-five and want to thank you for your contribution to this world.